This exhibition commemorates the First World War by focusing on how the different areas of South Gloucestershire were affected. Whilst the men went off to fight, the factories at home turned their production to vital war work, country houses became convalescent homes and women came into the world of work as never before. South Gloucestershire made a vital contribution to the war effort, aircraft, motorbikes, even the boots the service men wore were all made, right here in South Gloucestershire. The exhibition also connects us to some of the experiences of our twinned towns in France. 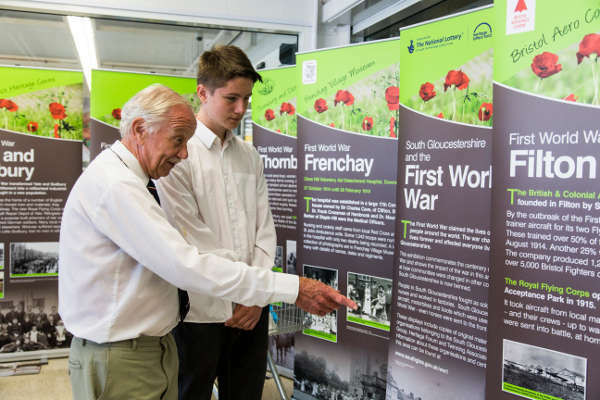 The banners tell these local stories using copies of original material from the archives of organisations belonging to the South Gloucestershire Museums Group and twinning associations. The exhibition banners are stored at different South Gloucestershire Museums. Contact Yate Heritage Centre e.mail: info@yateheritage.co.uk to book and liaise with other museums. The exhibition consists of twelve light weight pull up banners.